From the motorway, follow the signs reading “Flughafen Köln/Bonn”. When on the airport motorway, stay on the right hand lane and follow the sign reading “Express Cargo / General Aviation” which you may expect some 1000 m prior to the Main Terminal. 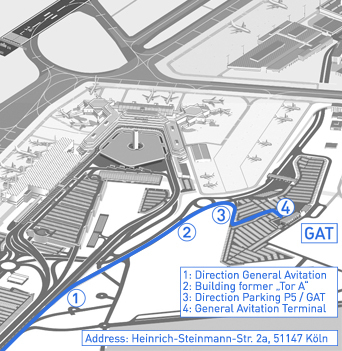 After having passed the decommissioned Gate A (Tor A) take the first to the right (at the roundabout) and just follow the signage which will lead you through the parking area P5 to the General Aviation Terminal.